On 13th September 2018, Shinta Indah Jaya organized an event, ‘Kebersamaan Satu Hati’ or ‘Together with One Heart’, at its factory in Tangerang. 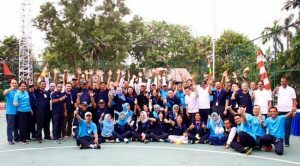 This is a follow-up from its previous ‘Run with a Heart’ campaign and aimed to foster team spirit and unity amongst workers in addition to raising awareness on the importance of healthy living. 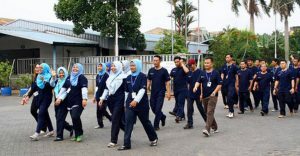 The event featured senior management members and workers participating in a 4km run around the company’s factory complex with the President Commissioner, Ms Stacey Hermijanto, leading the festivities. 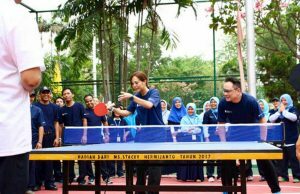 In addition to the run, there were also table tennis and basketball games that further encouraged the principles of teamwork and unity; a vital aspect to the success of the company going forward. Through this latest campaign, Shinta Indah Jaya hopes to strengthen its purpose-driven corporate culture. By instilling the values of honesty, integrity, and professionalism, combined with a collaborative leadership strategy, employees are aligned with the company’s goals and objectives, thus achieving mutual growth and development. Founded in 1971, Shinta Indah Jaya is a leading manufacturer of high performance, quality knitted fabrics, that is driven by our core values of teamwork, integrity and passion for excellence. Sign up for our newsletter to get more information about our latest products and events.